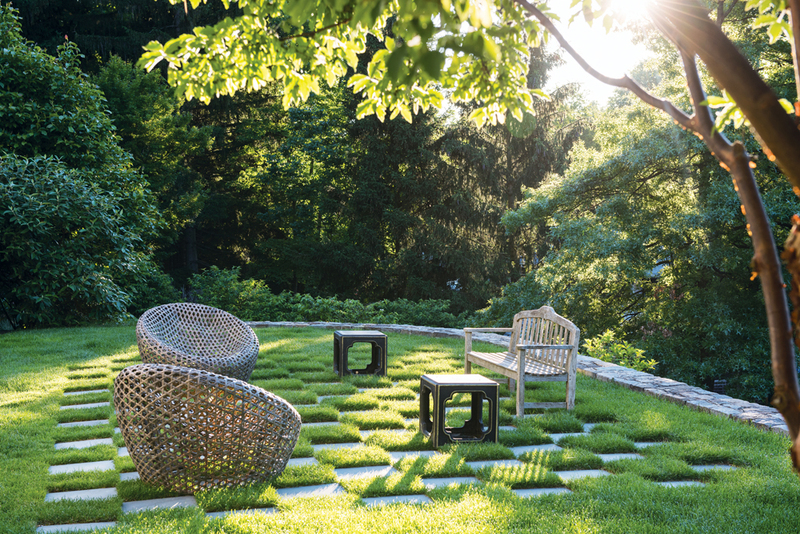 Wanting a checkerboard effect in one section of the property, the wife got tips from landscape designer Susan Cohan and then tasked a landscape contractor with installing 18-inch bluestone squares and grass in between. “It’s easy to maintain,” Cohan says. “You just mow over it.” The teak bench once belonged to the wife’s grandmother. Reclaimed granite curbs form steps in the sloping lawn near a naturalistic planting (ornamental grasses, peegee hydrangeas, yarrow and more) that’s designed to be viewed from the pool. 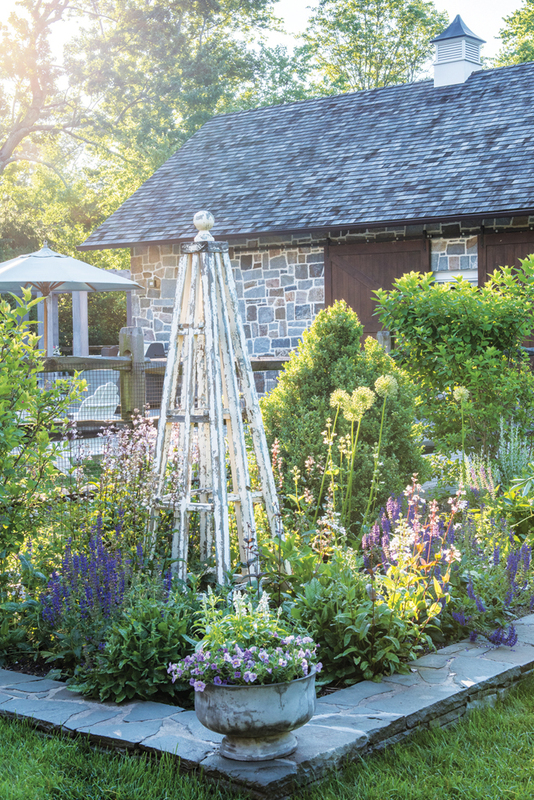 Landscape designer Susan Cohan terraced the colorful planting bed with boulders. In back of the pool house, Susan Cohan chose the wall’s stone to harmonize with, but not match, the structure. In early spring, the bed holds a profusion of blooming bulbs; the purple ‘May Night’ salvias shown here steal the show in mid-spring. 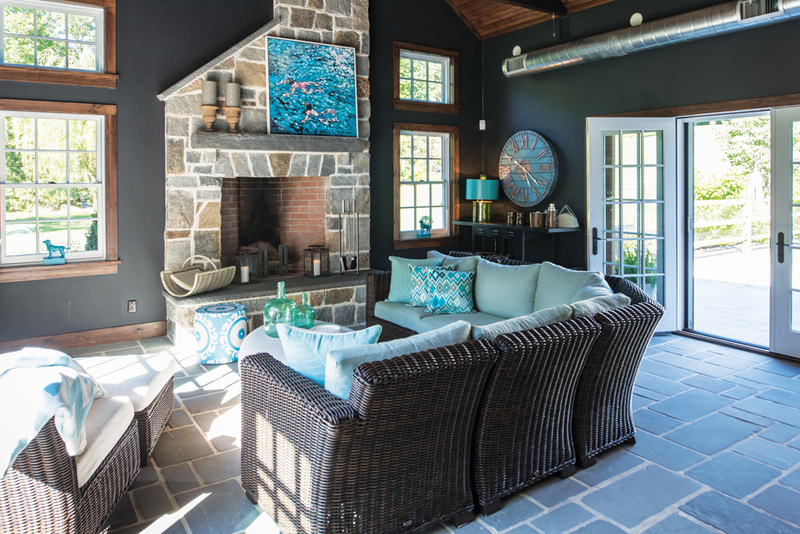 The homeowners often host formal parties and impromptu barbecues on their bluestone patio. The pool area “is a real magnet for everybody, my three sons and their friends,” the wife says. Eight can dine at the table under the pergola, which is 8½ feet wide, 20 feet long and 9½ feet tall. 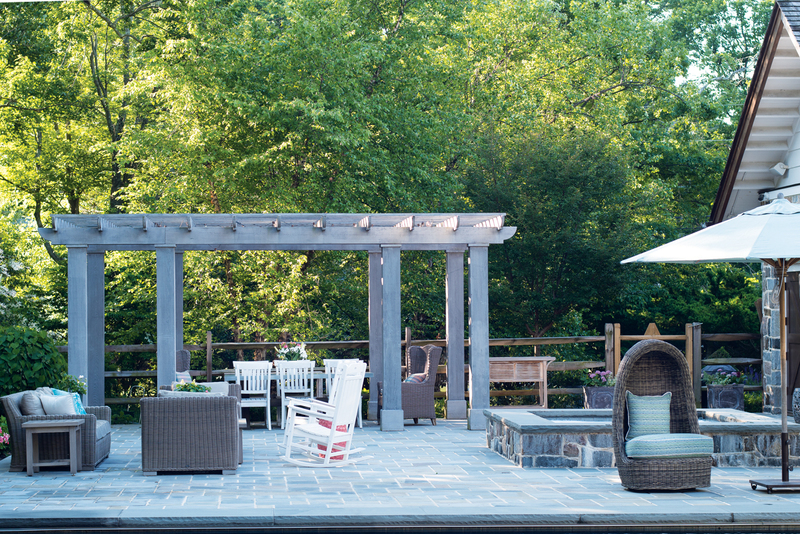 An accelerator product quickly changed the pergola’s brown cedar to a warm gray. 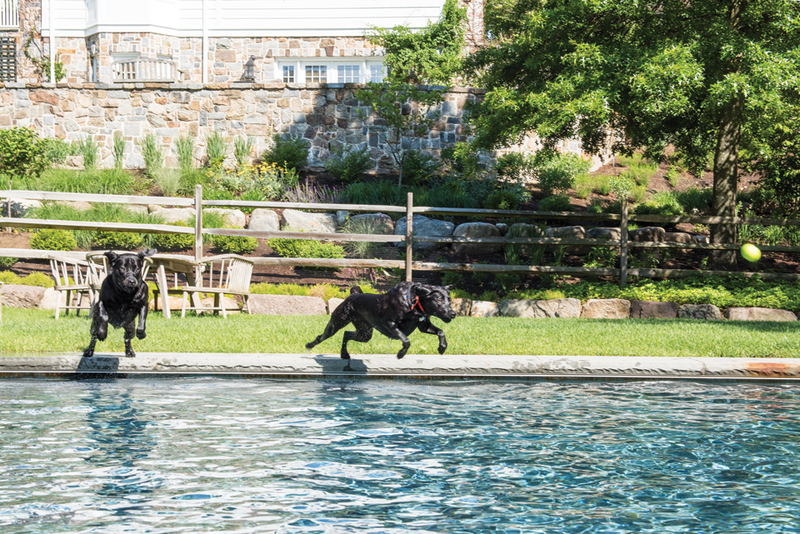 Labrador retrievers Winnie (left) and Remy charge into the pool while chasing a tennis ball. They swim all the time, the wife says. The wife furnished and decorated the pool house, a.k.a. “the barn,” which is used year-round. The furniture, made for outdoor use, is moved onto the patio for large parties. Not shown is the barn’s large television, which is great for watching baseball games, she says. A 6-foot tuteur (one of a pair) stands amid penstemon, Alpine betony, ‘Summer Beauty’ alliums, ‘May Night’ salvia, ‘Limelight’ hydrangeas and ‘Green Mountain’ boxwood. Later, blooming clematis will adorn the non-climbable mesh inside the split-rail pool fence. The wife created the container planting. A landscape designer attacks a cluster of problems in Essex Fells. When it comes to challenges, landscape designer Susan Cohan is no shrinking violet. 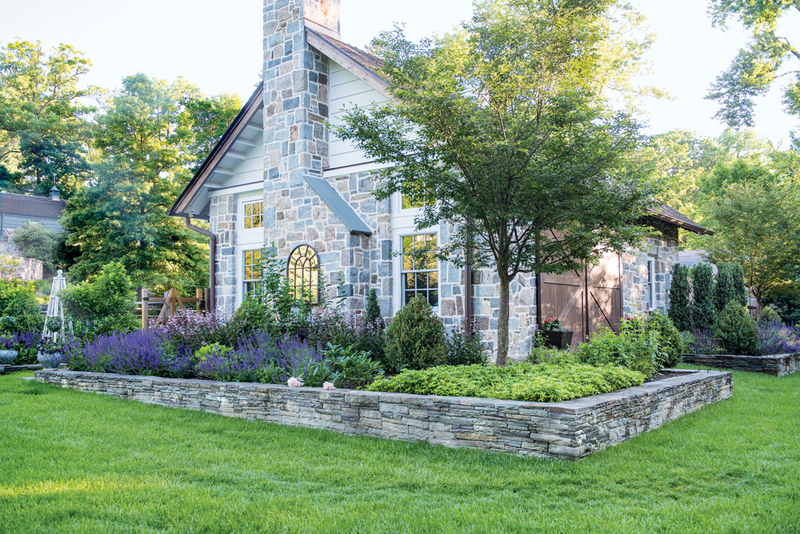 In planning a two-acre garden in Essex Fells located in New Jersey, she faced off against voracious deer, digging Labrador retrievers, a steep slope, poor drainage and compacted clay soil. But Cohan, a member of the Association of Professional Landscape Designers, points to one trump factor working in her favor: clients who are patient, understanding and in sync with her vision. The collaboration began in 2011, when the landscape was nearly all lawn, says the wife, who had admired photos of Cohan’s work on Facebook. “It was a perfect match” from their first meeting, the wife says. Although the homeowners had already contracted to do the pool and pool house (built in 2012), Cohan joined the team before construction, which allowed her to head off problems. For instance, she moved the spa to improve entertaining flow on the patio. 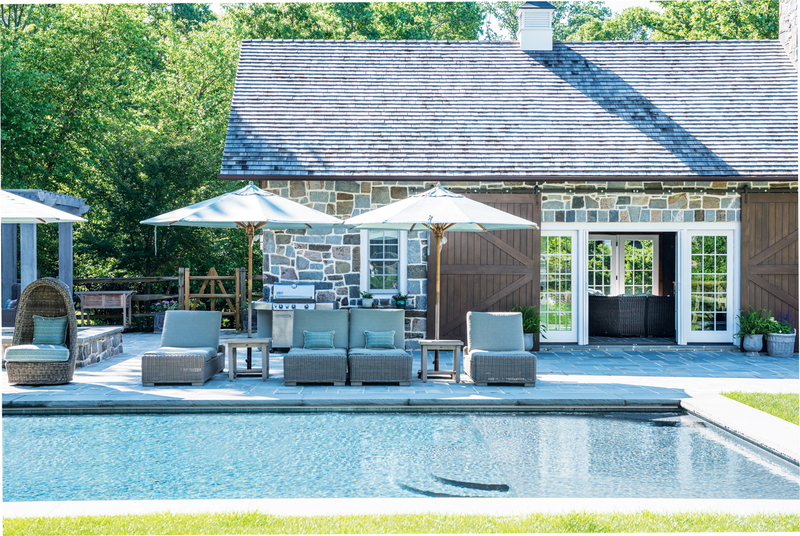 “The goal for me was to tie together the pool, house and pool house,” says the landscape designer, whose firm is Susan Cohan Gardens in Chatham, NJ. Key unifying elements are a cool palette for blossoms and stonework in the garden that complements stone on the structures without matching. The few existing planting beds were incorporated into the design, Cohan says, “so we just massaged them.” Workers filled holes and built walls for raised beds, adding “mountains of compost and soil as well as gypsum to break up the heavy clay” to keep plants happy without constant pampering. Its time came in 2015. 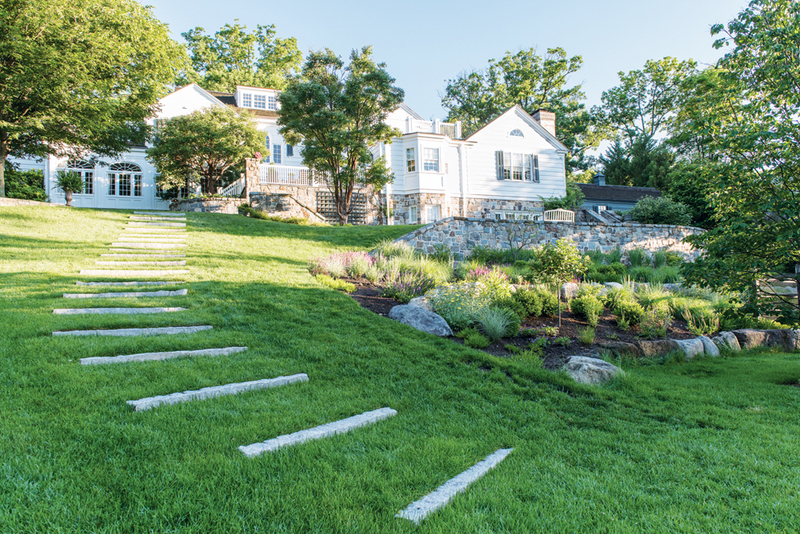 The “mass of pachysandra and weeds,” as Cohan describes the hill, was tamed with reclaimed granite curbs used as steps in the turf grass plus a two-tiered area of blooming plants and ornamental grasses designed to be viewed from the pool. Cohan terraced the planting with boulders, some that were already on-site and others brought in to match. The entire garden is designed for a sequence of blooms, starting with bulbs and redbud trees. “The peak bloom is up to the Fourth of July,” Cohan says. “Then it’s grasses and a couple of showier things. The color [including asters] ramps up again in fall” when family members return from their shore home. All the while, “my plan is for plants to duke it out with each other, and the strongest survive,” Cohan says. If a plant struggles in a particular spot, she moves in something that’s doing well elsewhere. “Every year we do a little bit more,” Cohan adds. “I never wanted the property to look like it was just done. We wanted it to look like it was done over time. “And now it has been done over time, over about five years,” she says with a laugh. Freelance writer Mary Vinnedge, an avid gardener, is a big fan of Susan Cohan’s sense of humor and practical approach to landscape design. Landscape design, Susan Cohan Gardens in Chatham; pool house design, Francis C. Klein & Associates, Architects in Montclair; pool house contractor, Jack Finn & Co. in Montclair; pool and spa, Marson Pools in Oakland; landscape contractor (including creation of checkerboard area), Cecere Bros. Landscaping in West Caldwell; lawn, masonry, fencing and drainage work: Scheppe Landscape Services in Summit; furniture, Garden Cottage in Fairfield and Morristown.